What to do with 100’s (maybe 1000’s!) of cat photos? For cat lovers like us a calendar is the purrfect answer, and for the past 18 years we’ve put together a wall calendar featuring our beloved Siamese cat Damien. Damien passed away in August of 2014, and we wanted to make the 2015 edition of his calendar the best ever. 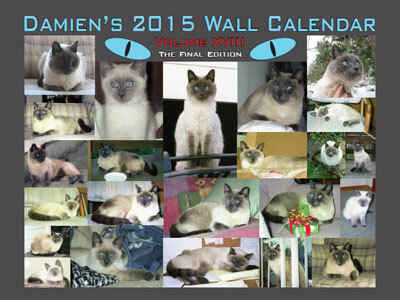 The final edition of Damien’s wall calendar series is a full color edition that commemorates the life and times of our special feline friend. NOTE: For the final edition of Damien’s calendar we outsourced the printing… 100 full color copies was more than we could handle with our HP photo printer. Fortunately we found a great place to work with – DocuCopies.com. We highly recommend them based on customer service, quality of product, and price!